In the past several years of running pursuits it seems that I’ve to an extent lost touch with the real reason for going into the woods. Running is of course, enjoyable in its own right, and I by no means intend to diminish my love of the sport, or the races that exist on the terrain that so compels me. Instead I intend to embrace the realization that I’ve been training for the sole purpose of competition, and not for the sake of training itself, and these two views needn’t be mutually exclusive. The last week of August I received a text message from Steve wondering if I wanted to go to the White Mountains for a few days over Labor Day weekend. Little did he know that I had already reserved a camp site with the intention of doing some running/hiking/sleeping trail-side to clear my head after a summer almost entirely devoid of the activity. 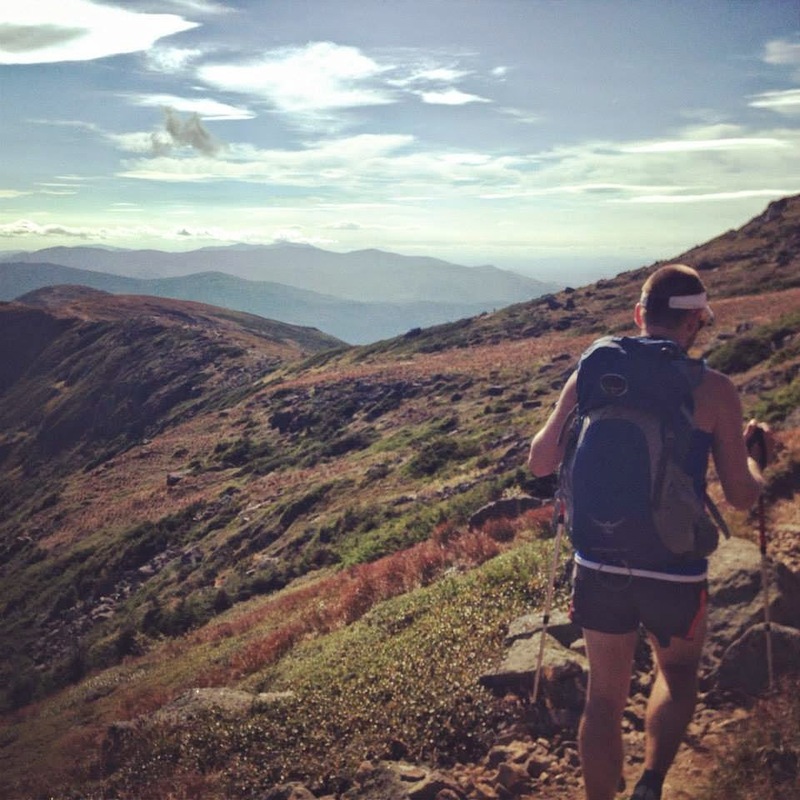 Steve had run his 100 mile debut at Leadville 2 weeks prior, and had invited his friend Bradley, with the main intention of hiking the Presidential Traverse. I added my old college buddy Marcus, and his co-worker Jed to set off on what turns out is my first pure hiking trip since 2011. The Presidential Traverse allows hikers to spend the majority of their day above treeline while bagging arguably the most iconic peaks that the range has to offer, all while being incredibly technical, and accumulating 7000-9000′ of ascent over 22 miles. It’s important to be clear that while we were hiking throughout the trip, we still maintained a running-oriented aesthetic, travelling lighter than most hikers traditionally would, and moving comparatively fast. Considering this, spending 8+ hours above treeline, moving at a relatively leisurely pace, eating “real” food (okay, nutella and tortilla is probably not a great example of real food, but compared to my running habit of gels-only it’s a major upgrade) and being able to chat and joke all day was a welcome refresher from the huff, puff, grunt and groan of the true mountain run. Moving at a pace designed with the sole intention of enjoying the space you’re in is strangely liberating. The camera beckons more, the lichens on the rocks speak differently, chatting with strangers is suddenly not an annoyance, but simply something you do. The lack of a goal (other than perhaps, reaching the bar before the kitchen closes) changes the entire dynamic of the adventure, reminding you that you’re doing this for the sake of doing it, not to win races, not to look better naked, not to win the adoring hearts of women and pets, but to simply exist in a rugged environment. In one of the more recent TNF vignettes, Rory Bosio says that if you’re doing it right, training shouldn’t feel like training, it should feel like vacation. I’ve seemed to lose track of this, concerning myself too much with the statistical side of my running, getting frustrated with myself on days where my legs refuse to allow me to run up a given incline, or across particularly technical terrain. But in reality there’s a validity to hiking, it’s a necessity in almost all ultra-marathons (or at least in almost all of the races that I’m eyeing). Hiking up hills is an acquired skill that must be practiced, and the descent can be a clinic in foot placement. Most overlooked however, is that hiking, whether for the sole sake of it, or part of a training regimen, or even sometimes because that’s the fastest your body will allow you to travel is good for the soul, a proper recharge, or chance to hit the reset button and evaluate your priorities in both your athletic and regular life.